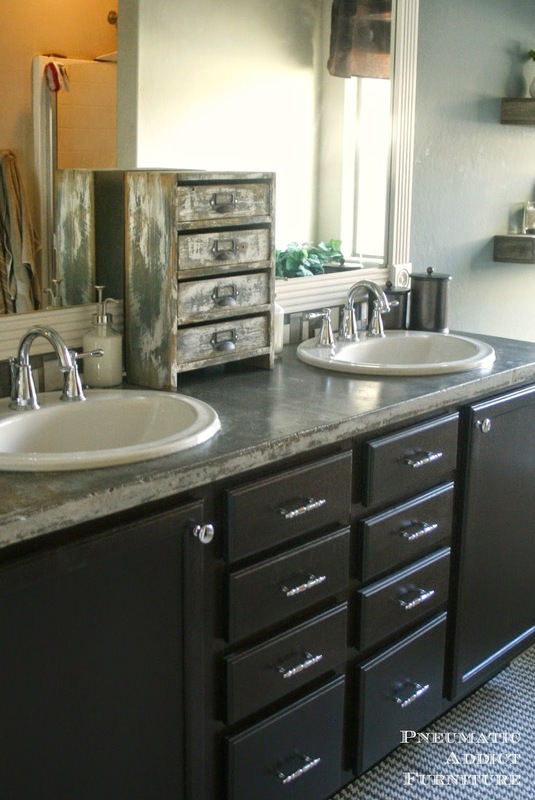 If you are new here, I have been sloooowly updating my master bathroom. 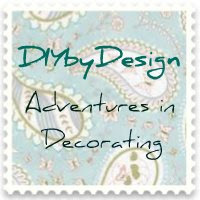 In addition to darkening my stock vanity cabinets, DIYing concrete counter-tops, and upgrading my lighting and hardware, I've been trying to spruce up the decor a bit. Back when I was a teenager, my mom had a best friend that I idolized. She was only like, 12 years older than me, beautiful, and hilarious. I remember one day when I was in her bathroom, I discovered that she kept her make-up in a decorative chest on the counter. Great idea! Kill 2 birds with one stone. 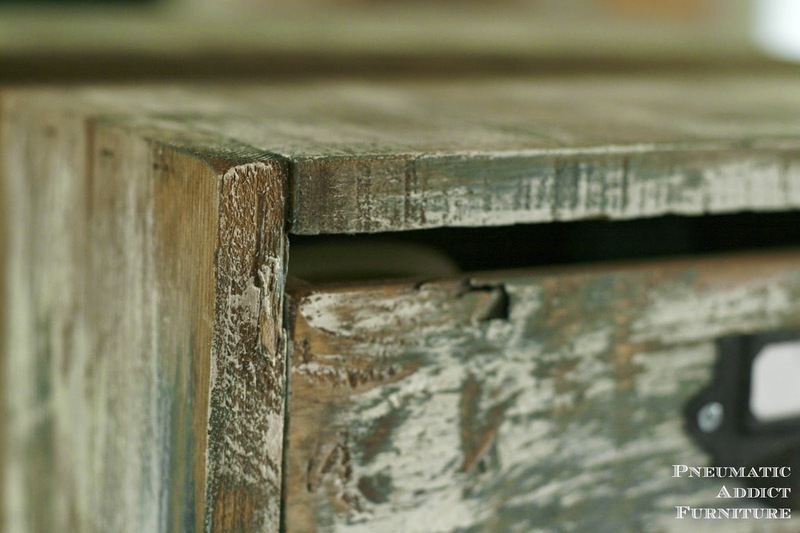 Free up scarce drawer space, and add a cute design element. I was using the same, dirty chest I bought for my first apartment. Time for something new. I know a few ladies that use little plastic drawer things to hold and organize their make-up. Since this is going to be on display, I think I can do better than that. 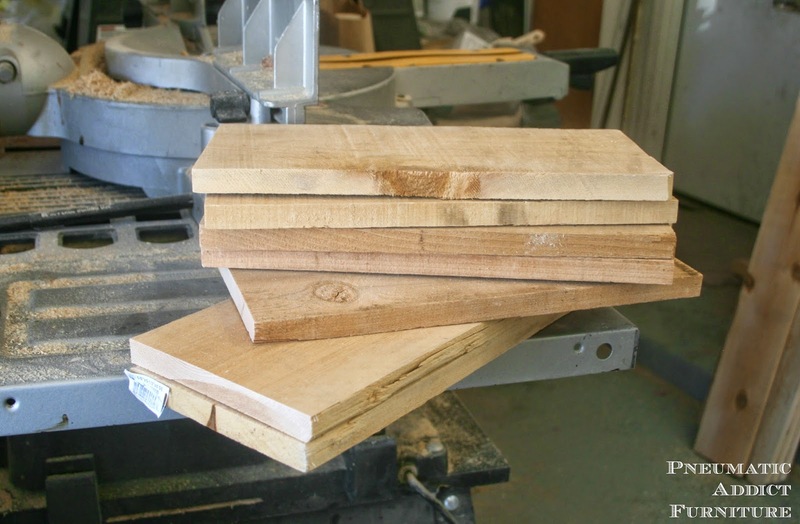 I started with my favorite reclaimed wood substitute, AKA fence boards. I used the wider of the two commonly found sizes, approximately 5.5". I cut two pieces at 17" and five at 11" long. Assembling the frame is pretty basic. Its like building a basic box, you just add more dividers. 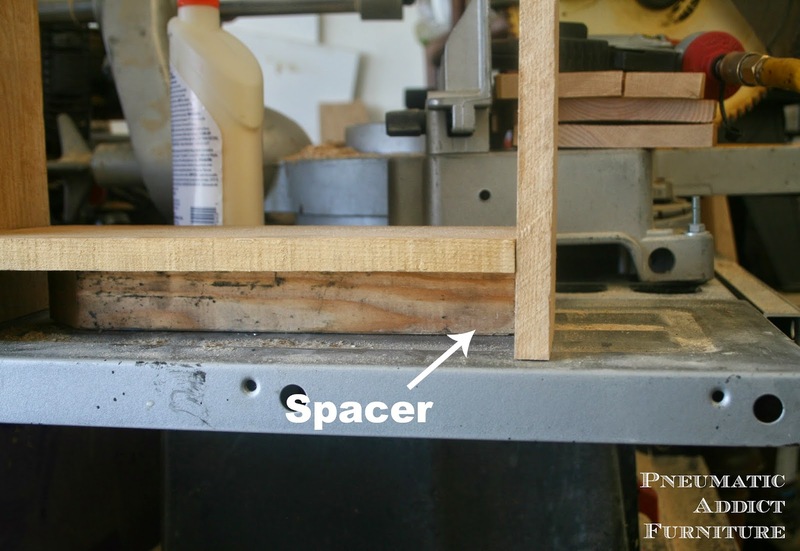 For an easy way to ensure the bottom board is square, use a scrape piece of wood as a spacer block. This way, you are sure your board will be joined at the same height on both sides. I used wood glue and 1 1/4" brad nails to join the pieces, starting with the bottom, then the top, and finally the 3 center dividers. Now that I had a frame, it was time to make the drawer boxes. Do these look familiar? 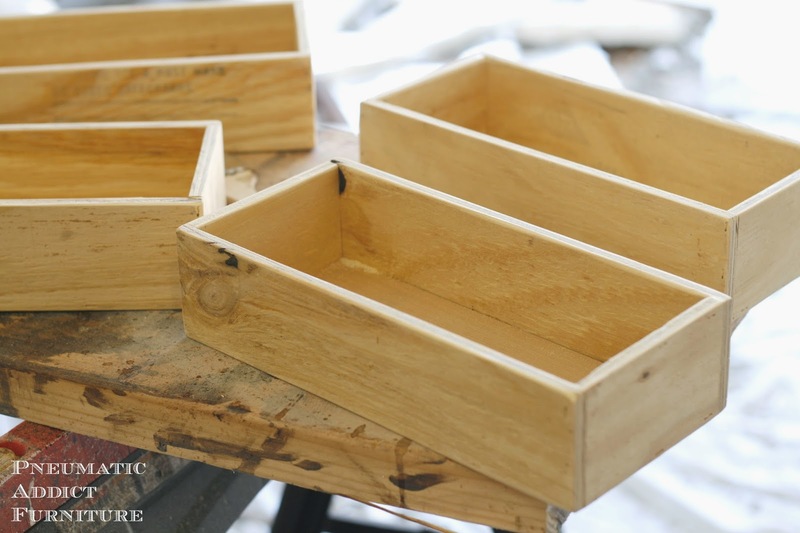 They were made from the same plywood and in the same manner as these 30 boxes. Once again, pretty easy. Now that everything was built, it was time to start the finishing process. 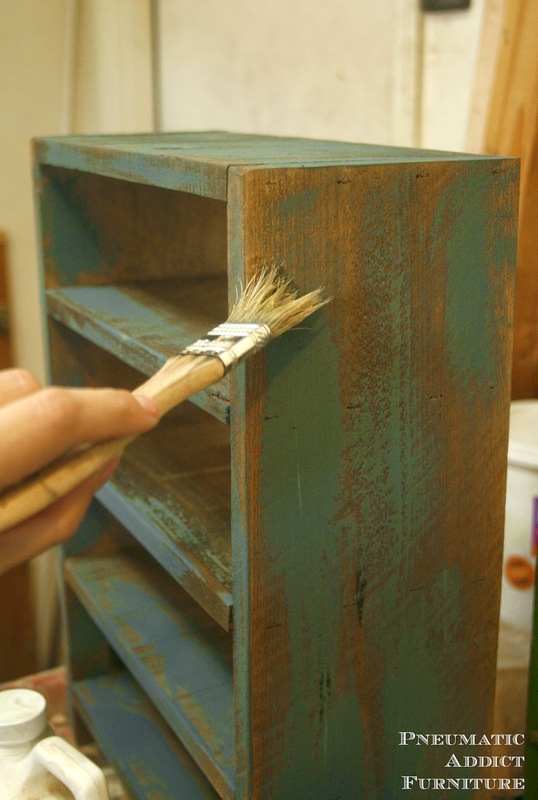 The first step was to brush all the wood with homemade oxidizing solution. 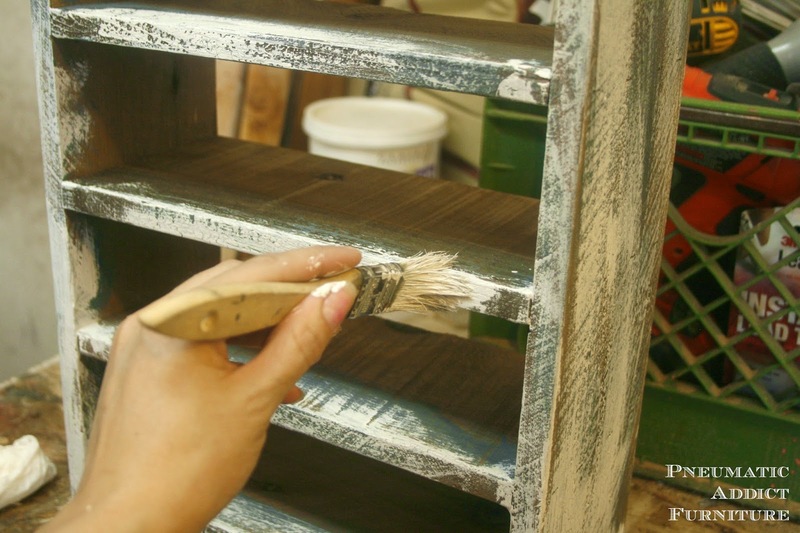 The next day, I gave both the frame and drawers the worst paint job ever, using a bluish gray, latex paint. 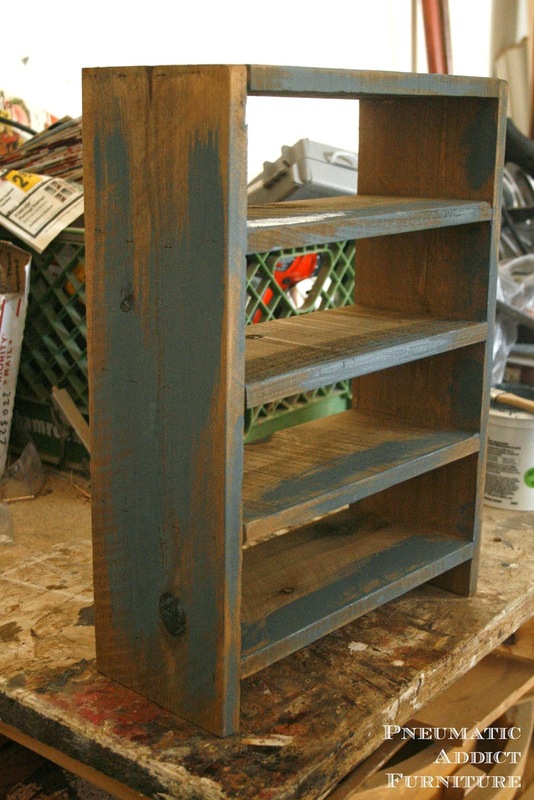 I knew I was going for a super distressed-reclaimed look, so I intentionally was very sparse with my application. 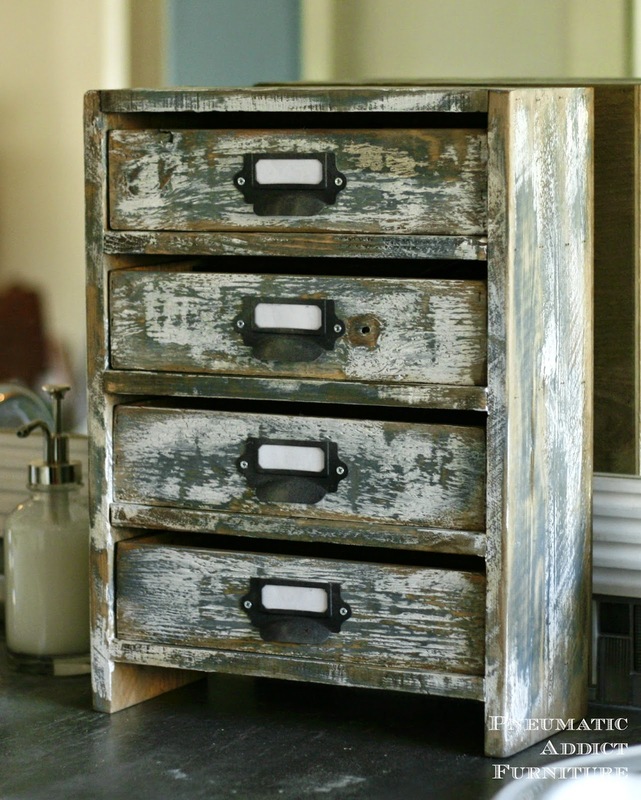 Once that was dry, I pulled out some Antique Crackle from Old Fashioned Milk Paint. This stuff is fun to play with. If you aren't looking for large, 90's-ish cracks, I have a little trick that I share here. 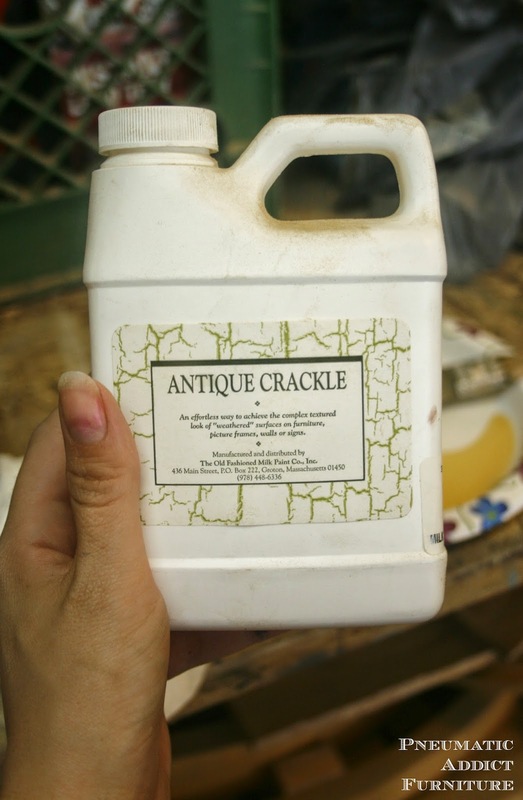 It does create cracks, but more importantly, it causes this great, antique texture in the paint. After the crackle medium, I applied another crappy coat of paint, this time in white. I placed everything outside to dry, which in Arizona during the summer took about 3 minutes. 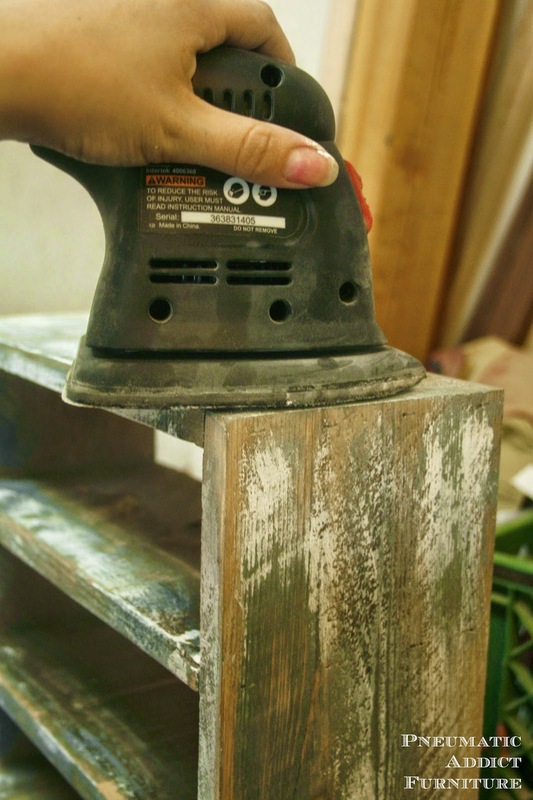 Next, I went crazy with the sander and some 60-grit. I intentionally took off the majority of the paint. I wanted to see the wood underneath. I sealed everything with a coat of wax and allowed it to dry. 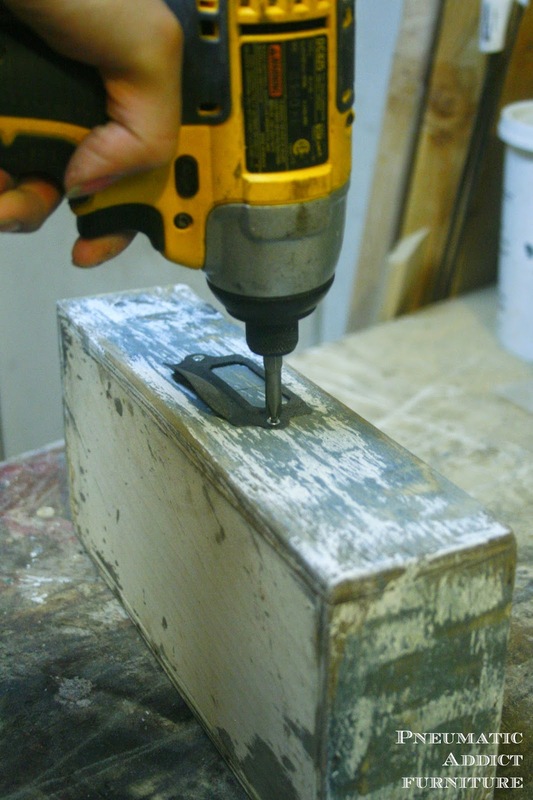 Once dry, the last step was to attach the label holder pulls, which were generously donated by D. Lawless Hardware. Here is the final result. It looks like it was drug behind a truck, AKA, perfect. 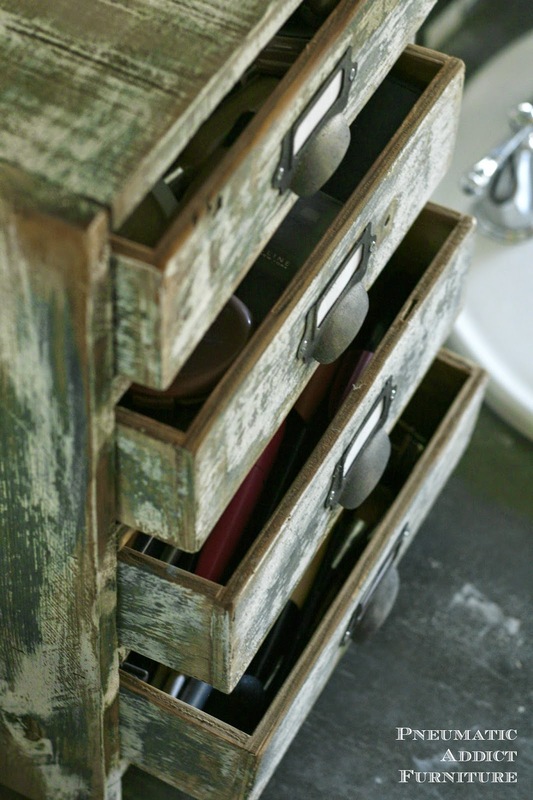 It gives me TONS of storage, and I love how the 4 drawers help me organize my make-up. Before with the chest, everything was just thrown in and eventually got broken and covered in the remnants of 100 different types of powder. So much better this way. Okay, I have a confession. I ordered the label holder pulls in black. They looked fabulous, but a little too "new" next to the super chippy wood. I fixed that with a little of this and a little of that. Mostly, gray primer, black spray paint, and aging dust. They still look black...just old black. And here is where my new storage box will stay. Proudly out in the open. My make-up hiding in plain sight. What do you think? Would you "hide" your make-up this way? 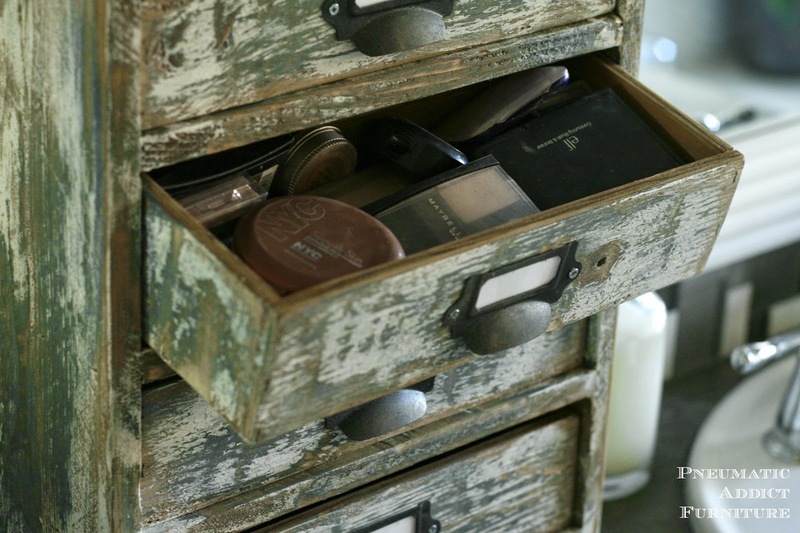 Or, do you have any other clever ideas for make-up storage? Nice, I love how you distressed it! So pretty Elisha! I keep my cabinet on my counter top too! It looks so nice on your pretty new countertop! I love you tips for the crackle too.. Pinning! That's awesome Elisha! I love how it turned out and how much storage it gave you. This is just so pretty and practical. 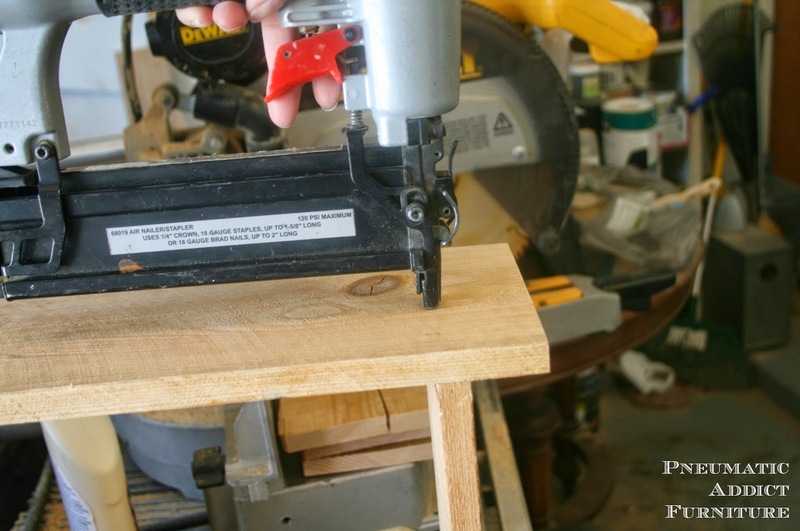 What a great gateway DIY project! Thank you for sharing this. Lovely and I especially like the complete look of the bathroom. 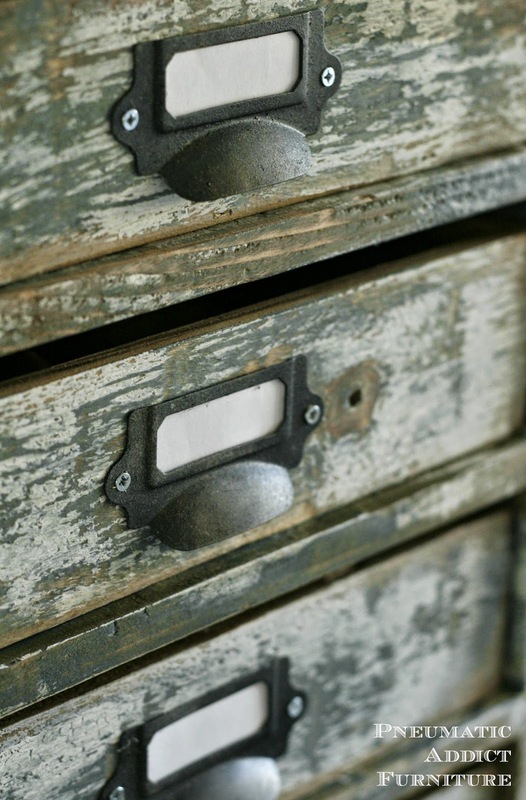 What can I say...little drawers, distressed paint, label pulls, hand-made...perfect! Wow, it's hard to believe it's just been made, it looks like it's been around for years (in a good way!). Love how you made the black label holders into old black! You have officially convinced me that I need to make one of these fabulous boxes! I love the pulls and paint finish.